Description: The flowers are in umbel-like clusters above the leaves. 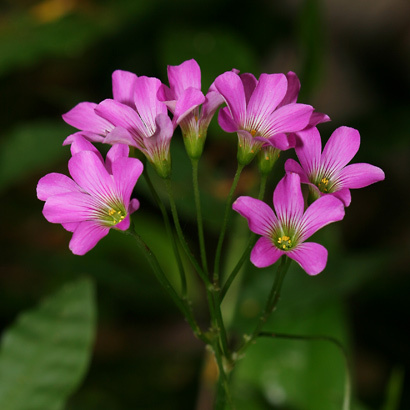 The individual flowers have 5 round-tipped petals with a streaked base. The flowers are sometimes followed by cylindrical seed capsules. 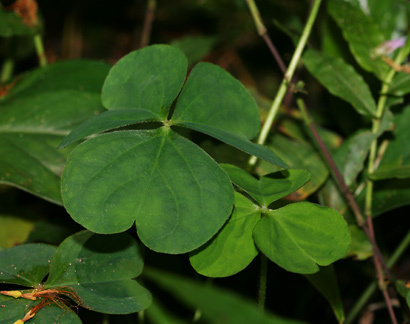 The leaves have long petioles and are clover-like and trifoliolate with 3 green, hairless to sparsely hairy, broadly heart-shaped leaflets. The plants grow from scaly, underground bulbs and are stemless with leaves in a basal rosette. This particular variety is grown as a garden ornamental and has showier flowers. 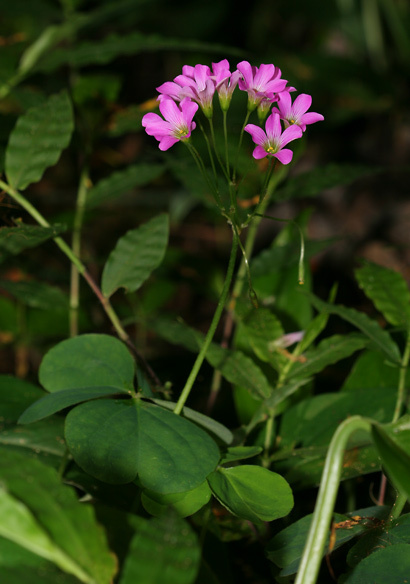 Here in Hawaii, Pink Wood Sorrel grows in moist, shady areas at lower elevations. The plants are propagated by small bulbils produced by the main bulb. Edible – The flowers, leaves, and roots are edible, but this plant should only be consumed in small amounts because it contains oxalic acid. Poisonous – The plants contain oxalic acid and can cause calcium deficiency if eaten in larger amounts.